With our unseasonably warm weather, I am ready to start putting some pretty flowers in the yard, but our rule of thumb in Colorado is never before Mother's Day. Those darn spring storms! So, until then, I'll have to just enjoy them on pretty cards like this one from Laurel. She used Loving Thoughts to create this spring delight. I like the white embossed flowers over her pretty stripes. 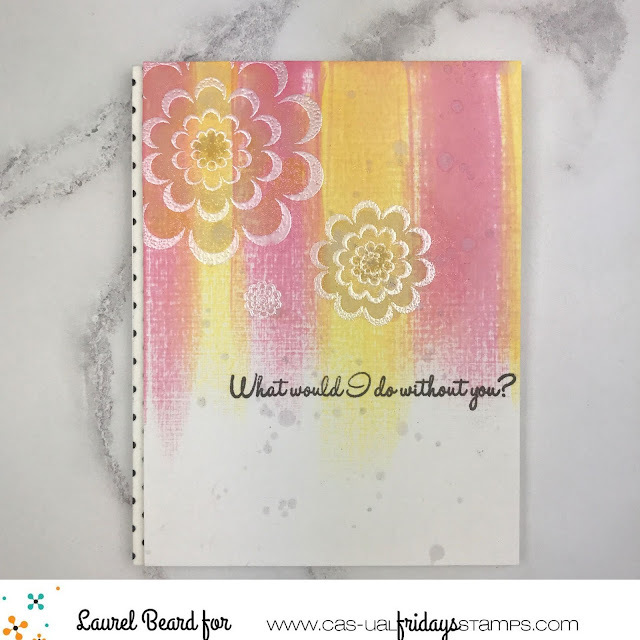 I think the little strip of polka dots peeking out from the pretty striped panel is darling, and it makes the black ink sentiment really work. For even more paper crafting fun, this pretty stamp set has a coordinating Fri-Die set called Loving Blooms that will cut out those pretty flowers and also double as scallop shapes for other projects! Very pretty Laurel, a great job!